“Simple to man, honest-to-God engineering”, is how the most famous auto journo of today, Jeremy Clarkson described the indestructible Toyota Hilux. However, all that is going through a radical change and our cars which are our pride and joy are being converted into robots controlled by computers instead of us, the users and that is also why we’re not going to have another Hilux which can be called indestructible. Computers did take over things which made our life easy, fast and accessible from remote locations, but that’s where it should end because moving them further into our lives especially the cars isn’t fascinated by the automotive purists because car owners have a relationship with their cars. The most famous F1 duels were held in the time when F1 cars were literally go-karts with manual transmission and 1,200 BHP V12 engines. Ayrton Senna who is considered the greatest driver of F1 of all time followed by Canadian Gilles Villenueve. Ayrton Senna drove the McLaren MP4/4 which was one of the most dominant cars of the sport winning all but one race but finally Senna moved to Williams to drive a better and faster car then his McLaren, but he expressed the displeasure on the cars performance and then William came with a better car equipped with computer which balanced the car itself on the corners and all the drivers had to were go as fast as possible. Today, F1 lacks the energy it had in the past, infact pick up any form of motorsports and it does lack the same appeal and partly to blame are the influx of computer technology. 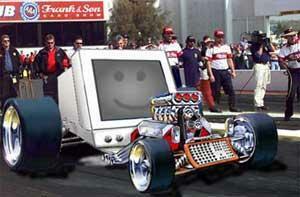 It is said that F1 is the test-bed of new automotive technology. Traction controls, ABS, transmission, safety, materials, etc were all tested in F1 cars before they were made available in the road-going cars. Apart from the equipment made necessary by the law in developed countries such as, ESC (Electronic stability Control), ABS and airbags – the newest Ferrari 599 GTO is one example of the level where the computers have got involved in a car today. All credit to the folk who manage to design, write and test this complex software which needs to be faultless to ensure the safety of the vehicle which is controlled.